Canada is the second largest country in the world. From St. John’s, Newfoundland to Victoria, British Columbia it’s roughly a distance of 7,400 kilometres. And from Vancouver heading north to Whitehorse in the Yukon Territory, it’s 2,400 kilometres. Add another 1,200 kilometres to reach Inuvik, the last community of any size before the Arctic Ocean. My point is Canada is huge. It’s best to focus on just a few areas if you plan to visit. Here are 100 of the best places to visit in Canada in the summer by region. Vancouver is at its best in the summer. Don’t miss a walk or a bike ride around Stanley Park, a trip up Grouse Mountain by aerial tram or via the Grouse Grind or a visit to Granville Market. For more ideas check out 27 things to do in and around Vancouver. The drive to Whistler along the Sea to Sky Highway is one of Canada’s most scenic when the sun is shining. And there’s plenty to do in Whistler in the summer – hiking in the high alpine, mountain biking, rafting, even skiing. Take the ferry from Tsawwassen to Schwartz Bay (or vice versa) for a scenic look at the southern Gulf Islands. You can go as a walk-on, take your bike or drive on, but make a reservation for your car if it’s over a summer weekend. The Butchart Gardens close to Victoria are definitely worth a visit. They boast over 55 acres of gardens including the famous sunken gardens. Fifty full time gardeners, 12 part time gardeners and 550 staff in peak season keep the gardens in fantastic shape. Allow a minimum of 1 ½ hours. Victoria is another city that’s much beloved by visitors. Stroll the inner harbour, visit three of the loveliest public gardens – all offering high tea or meals or try one of these two local hikes. Head to the hot and sunny Okanagan in BC’s interior for wine tasting. There are over 100 wineries so there’s no shortage of wines to taste. The Mission Hill Winery is one that’s well known for hosting outdoor summer concerts. I’d also suggest a bike ride on the Kettle Valley Railway especially in the Myra Canyon area. Or try one of these 5 hikes with a view near Penticton. Head north to Tweedsmuir Provincial Park and the surrounding area. It boast some one of my all-time favourite hikes in the Rainbow Range, first class fishing, peaceful mountain lakes and if you want a thrill drive The Hill towards Bella Coola on the coast where grades reach 17%. Wells Gray Provincial Park in the central region offers beautiful scenery in an unspoiled environment. Check out Helmcken Falls, the fourth highest waterfall in Canada, raft the Clearwater River or plan a multi-day canoe trip on Murtle Lake. Yoho National Park ranks as one of the most beautiful in Canada. Its part of the Canadian Rockies World Heritage site boasting 28 peaks about 3000 metres. Hiking is superb especially on the Iceline Trail and anywhere in the Lake O’Hara region. Haida Gwaii, formerly known as the Queen Charlotte Islands is a great destination if you like kayaking, fishing, whale watching and pristine beaches. Plan a kayaking trip that includes the standing poles at SGang Gwaay, a UNESCO World Heritage Site. Head for the Calgary Stampede taking place every year for 10 days beginning the first Friday after July 1st. Dinosaur Provincial Park boasts some of the most impressive Badlands scenery you’ll ever see. It is home to more complete dinosaur skeletons than anywhere else in the world. And it’s a photographer’s dream. Waterton Lakes National Park, located on the border with Montana is in a spectacular setting. Enjoy world class hikes including the famous Crypt Lake Trail – offering a ladder, tunnel and chains. Maligne Lake in Jasper National Park is always popular. Boat rides to Spirit Island – one of the most photographed sites in the world are one of the must-do activities. But you can leave the noise behind and paddle to the end of the lake and even stay for a few nights. Banff National Park is one of the most visited in the world. And if you get away from Banff and Lake Louise you quickly lose the crowds. But where to go? There is a lifetime’s worth of hiking in the mountains so best it’s best to check with the National Park office in downtown Banff to choose something that matches your interest and ability. No matter what, don’t miss a stop at Moraine Lake. In Jasper National Park the Columbia Icefields are a big draw. You can hike to a glacier or take a tour that actually takes you out on the glacier. These are 5 stunning hikes you’ll want to do along the Icefields Parkway. I’d call it Canada’s most scenic drive – the 290 kilometres that start in Banff and finish in Jasper. Take a few days to do it so you can enjoy all the side trips. Edmonton offers the internationally renowned Fringe Festival. Wood Buffalo National Park located in northeastern Alberta and the southern Northwest Territories is the largest national park in North America. It protects the world’s largest herd of free roaming wood bison. It’s possible to camp, canoe, fish, hike and view wildlife – though access is via Fort Smith in the Northwest Territories. Head for Grasslands National Park in the south central part of the province to discover a world of big skies and high grass prairie. It’s also Canada’s darkest Dark Sky Preserve. Look for the Black-tailed Prairie Dog – the only place to see them in Canada. Go north to Prince Albert National Park, formed to protect a slice of boreal forest. Hike, canoe, fish, camp and visit Grey Owl’s cabin on foot. In western Saskatchewan in the Cold Lake area plan a hike or backpacking trip on a section of the Boreal Trail. Saskatchewan is famous for its fishing. Visit a northern lake and check it out for yourself. Canoe the Churchill River – one of the classic paddles to do in Saskatchewan. Catch the Saskatoon jazz festival. Or watch a Shakespearean play on the Saskatchewan River from mid-July to mid-August. Head to Churchill. Go looking for birds, polar bears and beluga whales. Get your fill of festivals in Winnipeg in July. With over 100,000 lakes and rivers there are a lot to canoe. Some worth thinking about are the Blood Vein River in the wilderness and the Red and Assiniboine Rivers close to Winnipeg. The Caddy Lakes Tunnels in Whiteshell Provincial Park also offer a memorable experience. Check out Riding Mountain National Park for hiking, canoeing and a chance to discover the forested parkland surrounded by prairie. The Peeks Toronto Caribbean Carnival, formerly Caribana – the largest festival of its kind celebrating Caribbean culture – takes place every summer in Toronto. It’s been called North America’s largest street festival. Niagara-on-the-Lake is famous for its Shaw Festival Theater. Book a show and then take a wine tasting tour. Or check out all 15 things to do in Niagara-on-the-Lake. Cycle the Niagara Parkway from Niagara-on-the-Lake to Niagara Falls. It’s an easy 25 kilometres. Take a boat tour of the Thousand Islands. Or if you have time take a multi-day kayak tour through the 1000 Islands. Head for the tip of the Bruce Peninsula. Dive in Fathom Five National Marine Park or hike a trail through Bruce Peninsula National Park out to the Georgian Bay to admire the cliffs and shoreline. For a weekend of slow travel visit Point Pelee Island – the southern most inhabited place in Canada. Accessible via ferry from the mainland, plan to come and relax though there is a winery, some hiking trails and a bike rental outfit. Rent a cottage in the Muskoka region. Or book a room in a lodge in Algonquin Park. Paddle the French River. Stay in the fabulous Lodge at Pine Cove on the French River. Hike the white quartzite cliffs of Killarney Provincial Park. It’s an incredible place for canoeing too. Visit Manitoulin Island, the largest lake island in the world. Rent a cottage, camp but whatever you do be prepared to do it at a relaxed place. Don’t miss a visit to Misery Bay Provincial Park; it’s not anything like its name suggests. Visit Science North in Sudbury. Exhibits are compelling and hands-on – and not just for kids. The Wildfire movie is not to be missed. The north shore of Lake Superior is an excellent destination for adventurous types. Try all or part of the Coastal Trail in Pukaskwa National Park. Or head for Lake Superior Provincial Park and hike in the Agawa Canyon. Canoe in remote and unspoiled Quetico Provincial Park. Montreal is famous for its summer festivals. The Jazz Festival is the most famous attracting over two million people in a 10 day time frame. Quebec City has a 400 year history set against the backdrop of a walled city filled with narrow, winding cobbled streets. The place oozes history and charm in a manner reminiscent of old European cities. Set aside a day or two to walk the city and absorb the culture. Cycle the Blueberry Route around Lac St. Jean. Take a boat tour in the St. Lawrence River to see whales. Drive to the end of Highway 138 – just to see what lies there. Head for the Gaspé Peninsula. Poke about in the small fishing villages. Hike to the top of Le Mont Albert and look for caribou or hike to the tip of Forillon National Park. Photograph Percé Rock. Bike the Green Route through the Eastern Townships. Ferry over to the Magdalen Islands. Check out the largest amateur sand castle building competition in August. Windsurf. Ride your bikes. Hang out at the beach. Eat at any number of fabulous restaurants all over the island. And take your camera with you everywhere you go. This is one photogenic island. Take the ferry to Grand Manan Island in the Bay of Fundy for a few days of hiking, kayaking and relaxing. Visit the Mary’s Point Bird Sanctuary. It’s a major stopover for two to three million shorebirds every summer – all because of the Fundy shrimp. Bike the paths of Kouchibouguac National Park. Pole a canoe on the Miramichi River. Explore Hopewell Rocks on foot and by kayak. Bike Deer and Campobello Islands – two of the small but inhabited Fundy Isles. Check out Magnetic Hill near Moncton – an optical illusion created by rising and descending terrain. Explore the coastal trails of Fundy National Park. Hike to the summit of Sagamook Peak where you can see millions of trees. Visit St. Andrew’s By the Sea – a town you can easily spend a week in. Go whale watching, golf, kayak or take in the museums and galleries. Halifax is the biggest city and one that’s full of history. It’s also got more pubs per capita than any other city in Canada. Don’t miss the Public Gardens or Point Pleasant Park. Cape Breton Island is full of history and charm. Check out the Alexander Graham Bell Museum in Baddeck. Drive or bike the Cabot Trail. Hike in Cape Breton Highland’s National Park. Visit the Fortress of Louisbourg and see what life looked like a few hundred years ago. Kayak through the islands off the south shore. Look for antiques in Hubbards. Visit Peggy’s Cove, Blue Rocks, Lunenburg and The Ovens. Hike the boardwalk in Kejimkujik National Park at the seaside. Hike the dykes around Wolfville. Do the hike out to Cape Split near Blomidon. Canoe the lakes of Kejimkujik National Park – for a day or for a week. Discover the small towns that line the route of the Evangeline Trail. One is Tidal Bore River Rafting on the Shubenacadie River. The Shubenacadie (largest river in NS) is a tidal river that empties into the Bay of Fundy (home to the highest tides in the world). When the tide comes in a tidal bore (wave) moves up the river temporarily reversing its flow. As the river fills up it generates crazy rapids and rafting companies take groups out in motorized Zodiac boats to ride the waves. It’s the only place in the world you can experience this thrill ride. Another result of the Fundy tides in Nova Scotia is the erosion that has revealed some of the oldest dinosaur bones in Canada as well as the fossilized remains of the first reptiles to walk the earth. Joggins Fossil Cliffs is a UNESCO World Heritage site with fossils dating back 300 million years and the first evidence of the evolution from ocean dwelling to land dwelling creatures. I should also mention the Northumberland Shore of Nova Scotia for the warmest salt water beaches in Canada. Go to the beach. This is what PEI is famous for. The waters are warm and generally safe for kids. The Greenwich Dunes section of PEI National Park is absolutely lovely. Eat lobster – in any way shape or form. Fresh is good, so are lobster rolls. The same goes for pie. Bike the Confederation Trail for the length of the island – or at least part of it. Watch the Anne of Green Gables Musical in Charlottetown – now playing for it’s 49th season. Visit the house where the fictional Anne of Green Gables lived. Head off for a day of deep sea fishing. Even tuna are caught off the shores of Prince Edward Island. Be the first in North America to watch the sun rise at Cape Spear. L’Anse aux Meadows National Historic Site at the tip of Newfoundland is the most famous Norse or Viking site in North America. It’s a fascinating spot to visit. Bike the beautiful Avalon Peninsula. Hike a section of the East Coast Trail. Two hundred and sixty five kilometres are of a world-class hiking standard. Visit Trinity, one of the best preserved communities in the province. Take a boat ride to Witless Bay to admire the teeming bird and sea life. Do one of the day hikes in Terra Nova National Park. Take the ferry for a day over to Labrador. Keep an eye open for whales. Plan some time in the city of St. John’s – one that’s famous for its bars and night life. Read more about what local Candice Walsh has to say about what there is to do in the city. Take a boat ride down the fjord in Gros Morne National Park or better yet backpack the Long Range Traverse. Hike the Chilkoot Trail – though really it’s in BC and Alaska but often you stage the hike from Whitehorse. Backpack in the Tombstone Mountains. Visit the town of Dawson City at the heart of the world famous gold rush. The place is still full of characters. Drive the Dempster Highway. It connects the Klondike Highway in the Yukon to Inuvik in the Northwest Territories. Be warned – it isn’t paved. Visit Kluane National Park. Go with a group as this is big time bear country. Make the trip up to Yellowknife for phenomenal fishing. Backpack through the remote and wild Auyuittuq National Park in Nunavut. 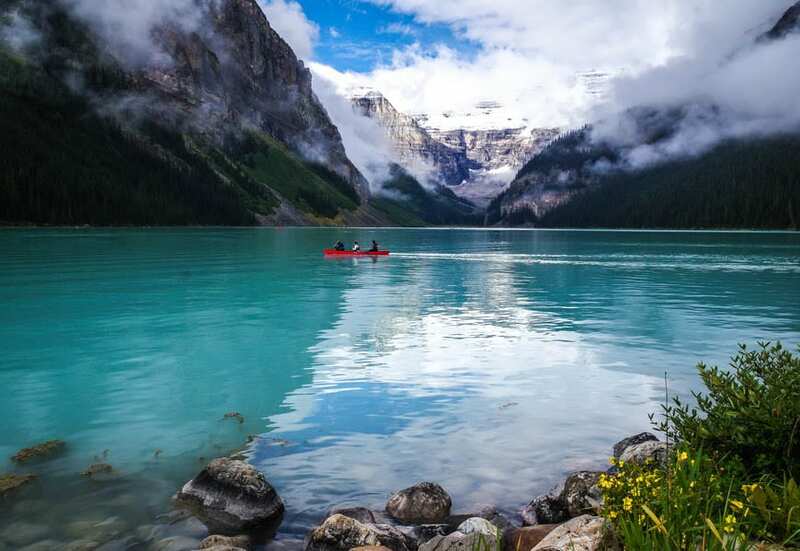 There are a lot more than 100 places to visit in Canada but hopefully you’ve discovered some new places by reading this blog. Bookmark this post by adding to your Pinterest boards. What gorgeous photos! I haven’t been to Canada since I was a kid. I’m really excited to explore Montreal next week and hopefully Niagara on the Lake in a few weeks. @Jennifer Although NOTL is touristy it’s also charming and beautiful. Walk the streets off the main street, take some wine tasting tours, maybe even a cooking class and bike to Niagara Falls. You’d definitely have a good time. I only counted 99 places, am I correct? @Tom Maybe – I’ll have to check. Amazing article, Leigh! It makes it easier for travel planning. I love the Stampede. Beautiful photos. @Salika I’m going to miss the Stampede this week though I would like to catch the concerts. There are lots of small rodeos around Alberta and BC that I understand are also worthwhile if you’re after the rodeo scene. Wow. This is massive and beautifully done. I’ve visited the places in BC and Alberta, but it seems I have a way to go before I’ve seen it all. @Christopher Ii think I got a little carried away – but I was just trying to be helpful. There’s so much of Canada to explore and such diversity across the country. I hope you come back. Great list! That fire simulator looks intense. @Natalia The fire simulator is intense. You do get jiggled in your seat, smoke bellows and it’s loud at times. Definitely a great movie that gives you such a sense of what it’s like to be on the ground and in a water bomber. What an awesome list! I am bookmarking this for when I finally have time to explore Canada. I’ve only been to BC and Ontario so I’ve got a long way to go. Love the photos! I would love to explore Atlantic Canada and see the Hopewell Rocks. of course, I’m still dying to see Banff NP soon. @Mary I did get carried away and obviously there are easily another 100 or 200 places to visit in Canada but hopefully it’s given you ideas. A lot of Canada is framed by the Rocky Mountains but the east cast offers just as much to see – and very friendly people. Thanks, Leigh. This is right on time. I’ll be in Toronto for TBEX in June and plan to visit family in Ottawa and Montreal then a return visit to Quebec City. That much is planned but I’ve been looking around for other places to visit while I’m there. I’ve already picked a few from your post, which I’ve bookmarked. Huge thanks!!! Oh, and did I say what a fabulous list this is? Your photos are absolutely stunning! @Marcia I’ll be curious to see where you end up visiting. You can’t go wrong with Quebec City but if you can go a little further north to the Saguenay Fjord area I think you’d be pleasantly surprised with the scenery. The Eastern Townships are also a great destination and aren’t far from Montreal. This is a super guide, Leigh! I’d love to visit all of the provinces. I’ve been lucky enough to get to a few. One of my favorite travel memories from growing up was a trip that took us to Nova Scotia — it was so beautiful and dramatic. @Cathy I’m heading to Nova Scotia for two weeks in June and looking forward to revisiting old favourites and discovering some new ones. I love the drama of the south shore too. On my list: Western Canada, and now also Saskatchewan (love the photo. And the name just sounds cool). Also, it would be fun to see where my Vikings ancestors hung about. @Sophie Saskatchewan isn’t high on many people’s list and yet it really does offer a lot. I love the place or it’s big sky feeling, the grasslands and after I’ve visited again in September I’ll be able to wax eloquent about it’s northern lakes and rivers too. L’anse aux Meadows is a fantastic spot to visit. Wow! That is quite the list. It makes me realize how little of eastern Canada I’ve seen. I fall into the mindset of thinking that eastern Canada is not as beautiful as western Canada, but your photos are gorgeous! @Laurel I am s looking forward to exploring more of eastern Canada this summer. I have lived in Nova Scotia on a couple of occasions but haven’t been back to the Halifax/south shore area in 25 years. There is so much to do that I hope one year the region figures in your plans. Amazing recommendation of Canada as a holiday destination. I’ll start saving up immediately. @Mette And if you make it to western Canada I’ll be happy to show you around the Banff area. Great article! Thanks so much for sharing! For anyone looking to explore Eastern Canada, Prince Edward Island would love to have you. We have 3 weeks in Canada in May and I was hunting around for what to do. You’ve gone way over with this article and I now have everything I need plus a whole more. @Bella There’s so much to do in the summer here – and that’s when Canada really shines. @Eileen Glad to hear that. I’m always welcoming to our American friends – and feel the same way when I cross the border. Fab list, Leigh. And you have some all-time favourites of mine- Dinosaur Provincial Park, Quetico, Killarney and even Misery Bay Provincial Parks (you’re good!! ), ma belle Montréal and Grand Manan. The latter we visited and fell in love with last year. Grand Mananers are very cool New Brunswickers/Canadians. A special part of the country for sure. @Judy Looking forward to discovering Grand Manan this summer. Will be kayaking the Georgian Bay near Killarney and will enjoy seeing that area from the water. Great post & photos. Perce Rock look like the Kaliakra cape from Bulgaria. Really great list! There’s SO MUCH to do in Canada. I’ve only just scratched the surface! @Amanda I know you’re one of the lucky ones who has been up to Churchill to see the polar bears – and I hope one day to follow in your footsteps. Nice list. I clearly have some travelling to do. With a focus on inking and biking though (in my hometown) I’d suggest that there’s a lot more to Calgary than stampede. We have a world class bike system along the Bow River that people love to ride, a zoo within biking distance of downtown (the penguins are hilarious). If you venture out to Banff there is a bikeway from Canmore to Banff (the Legacy Trail) and then biking to Lake Louise along the 60 kph parkway is jaw dropping. Lots do opportunity for wildlife sightings from the saddle. And don’t get me started on the hiking possibilities…..
@David I live in Calgary too and when I first moved here I couldn’t get over the biking trails. Most other Canadian cities have nowhere near the trails that Calgary has. I plan to bike from Canmore to Banff on one of my next available weekends. That trail always seems to have people on it. I appreciate your informative comment. @Tom And thanks for stopping by! You missed so much in Manitoba! @Shayn Share away. I plan to hike in Riding Mountain NP but don’t know much and for summer I really think of Manitoba as a canoeing kind of spot. I really would love to hear your suggestions. Amazing picture and interesting article. and great list thanks for the sharing. @Trip Thanks for stopping by. @Wendy I think you have your work cut out for you as what I mostly hear the Muskoka region referred to is The Muskokas. You have a point though. I was disappointed that you passed over Thunder Bay without mention. We are nestled in the wonderful wilderness of Northern Ontario, gloriously abounding with wildlife, and nature. We have some of the best fishing, hiking and camping areas in Canada. Our beautiful Sleeping Giant is world renowned, and the Blues Festival has been said to be one of the best ever. Just a short way from Thunder Bay, is majestic Kakabeka Falls, again something that people come from all over the world to see. And this is just some of the marvelous things about Thunder Bay.. We are Superior By Nature….. ..
@Bettijane I’m glad you left a comment so people can see your recommendations. It really is hard to cover a country the size of Canada and not miss a few great ones. You will be happy to know though that I am heading to Sleeping Giant PP in about 10 days and plan to include one of the hikes in my book on best adventures in Canada. I have not heard of the Kakabeka Falls so thank you for opening my eyes to that. That is a wonderful post… wow… so many places I still have to discover in Canada! I have a travel blog in portuguese and I would love to share all this info with my reader. Would you mind if I translate this article and reproduce under my blog, giving you all the credits? @Mirella As long as I get full credit with a live link back to my post that would be fine. Thanks… will do. I’ll let you know when I posted. @Mirella I’ll be looking out for it and will be happy to introduce the Portuguese people to Canada. Leigh, as always, the photos are fabulous and the adventures limitless. Must have taken you some time to put together 100 places! Fantastic article and timely for me, we are hoping to do about 7-10 days in Canada in September. Either B.C. or Alberta, so you’ve given us lots of food for thought here. @Greg Those 100 adventures are just a taste of what’s possible but at least they are a starting point. September is such a great time to visit. If you need any more suggestions let me know. This is a fantastic resource for anyone visiting Canada – even for Canadians I suspect. I agree about the most beautiful drive – it would be hard to beat the Jasper to Banff. My mind has been in Canada a lot lately and I have a feeling my body will be following some time in the next few years. Great list ! Thanks for sharing this information. Canada is really a beautiful destination to explore. @Melissa It’s especially fantastic in the summer. Last summer, I explore Bruce Peninsula. This summer, I’ll explore another province in Canada. Yay! Thinking of Alberta. We can’t wait for summer in Vancouver, when we love bike riding around Stanley Park and False Creek (stopping for coffee or lunch at an outdoor waterfront coffee shop or bistro). We also love evening picnics at a beach park – where we watch the cruise ships glide by on their way to Alaska. @Janice I love doing that Stanley Park bike ride as well – and miss watching those cruise ships go by my house when I lived in Vancouver. I’m heading to Victoria today & looking forward to a taste of green and colour. Your photos are gorgeous. I kept scrolling back and forth to look again and again to that photo of the Perce Rock. I haven’t been to Canada for almost ten years. Your posts made me miss it a lot. @Frank Thanks. I think Canada is a very special place in the summer. Wow Leigh! This is like a speedy tour of everything that’s amazing in Canada. One day I need to put a Summer aside and spend some time hiking in Canada. It would be hard to know where to start but I think you saved the best til last. The Chilkoot Trail would be high on my list. @Jenny I like the Chilkoot Trail for its history and for the fact you cross a border but I’d have to say there are more beautiful multi-day hikes that I’ve done. I’ve looked at this a couple times now – I’ve seen a few of these places, but there is so much more! Can’t wait to check some of these out. Great list! @Cindy There is so much to see and do in Canada – but I don’t think most people truly understand the breadth. Hopefully this list gives them some ideas. One more thing I would add to the list: whale watching in the Bay of Fundy. Digby Neck and Islands are one of the best places in North America to see a variety of whales. The tides of the Bay of Fundy make this area the perfect feeding grounds and as such many whales (minke, humpback, fin, sperm, and the endangered northern right whale are all regular visitors) spend the summer in the Bay of Fundy, feeding and frolicking. Ever seen a frolicking whale? It’s awesome! @Saskia That’s a very good suggestion. I do know that Grand Manan Island in New Brunswick offers many great whale watching tours but I hadn’t appreciated that the Digby Neck was popular. Your blog made me wanna visit Canada and the pictures are breathtaking. Canada is a great place for all nature lovers. There is easy to connect with nature! I have a good experience of Ontario because I have been there many of the times im my whole life to enjoy holidays and always spent lovely time there. Now my Uncle also has a plan to go there to enjoy coming holidays. I hope so that it will be a really great time for him. @shailesh A big welcome to Canada. Really hope you are able to get out and explore this great country of ours. Have fun doing it.